« “Prelude to War” World Premiere Performance in March! QUIET SPOILERS AHEAD: After the shock and awe of the last episode, A Disquiet Follows My Soul marks the beginning of the final story arcs of this series. This episode is all about picking up the pieces and getting back to the journey at hand after debilitating setbacks. The tone is fitting, because it was the first episode written and produced after the WGA strike crippled the show during production of last week’s episode, threatening to end the series early. 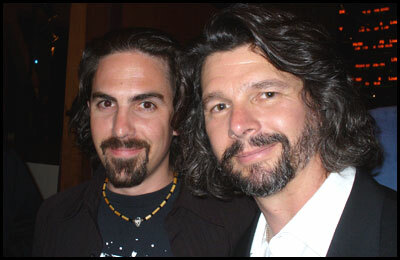 After many months of anxious waiting, production resumed in March 2007 and all of us working on Galactica breathed a collective sigh of relief. I will always remember these emotions when I see this episode’s opening scene. 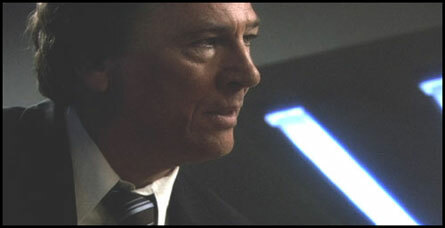 Adama wakes up, feeling groggy and disoriented, but gets up and returns to work. Recent events have exhausted him, but he’s grateful to have a purpose again. That’s basically how we all felt. Disquiet starts the engines on several story arcs, all of which will be essential as we go forward. One of these is the long-dormant Tom Zarek storyline. For the small percentage of you who may not know, Zarek is played by Richard Hatch, the actor who originated the lead role of Apollo in the classic Battlestar Galactica. Zarek has been a part of this series since early in the first season, Bastille Day, where he memorably sparred against Jamie Bamber’s new Apollo. As the series progressed, Zarek became less of a villain, and more a conflicted protagonist. 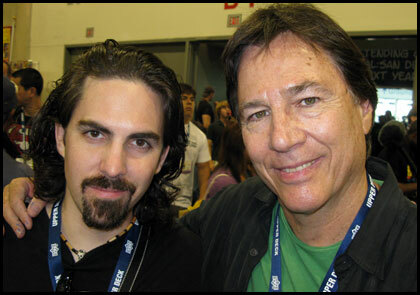 I asked Richard Hatch to compare the experiences of playing the original Apollo and Tom Zarek: “For me, Tom Zarek is quite different from Apollo in many ways. And to be honest although I loved playing Apollo in the original series, I found Tom to be a much more challenging and interesting character for me to play in this day and age. The complexity and unresolved issues that Tom and many of the BG characters had to deal with made acting in this series an extraordinary experience. 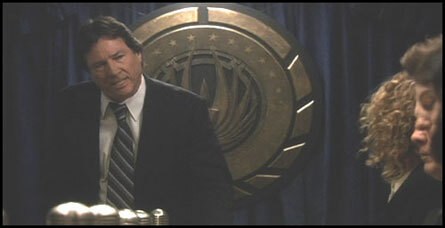 The first time his theme appears is under Tom’s moving speech to the quorum. 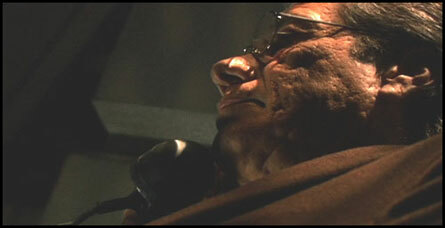 This scene is a rare glimpse into the complex, divided and multi-faceted character of Tom Zarek. I knew the instant I saw this scene that it required a theme that reflected the sadness, anger and determination broiling inside his mind. 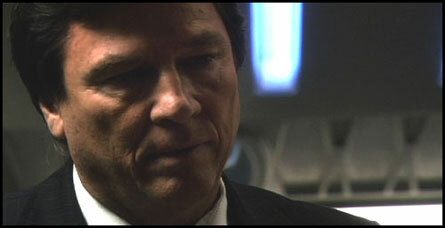 As a result, Zarek’s tune is more melodic and lyrical than most major character themes on Battlestar Galactica. It appears first in E minor and modulates to G# minor when the percussion kicks in and the arrangement grows darker. Something about this theme in G# really clicked for me. For the rest of the series, the theme will be heard almost exclusively in G# minor and performed, as it is here, by Paul Cartwright on the electric violin. 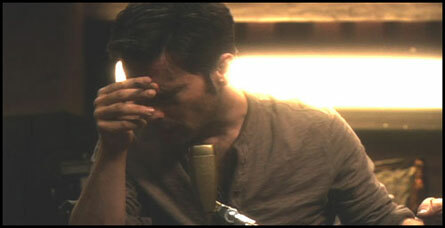 Richard’s powerful performance with Eddie in the brig towards the end of the episode required no music. However, as Zarek caves in and gives Adama the location of the missing Tylium ship, Cartwright’s violin sneaks in a melancholy and lonely statement of the Zarek Theme. Zarek’s hit rock bottom: back to the prison cell where we first met him. The Zarek Theme returns for a final statement as his storyline in Disquiet concludes. 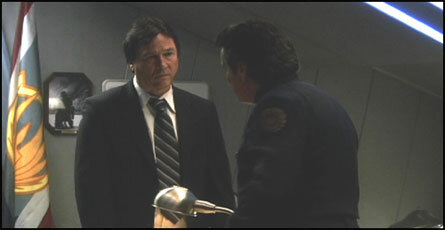 Zarek recruits Gaeta to join his cause in a secret meeting in the brig. However, this time the musical arrangement grows in intensity. 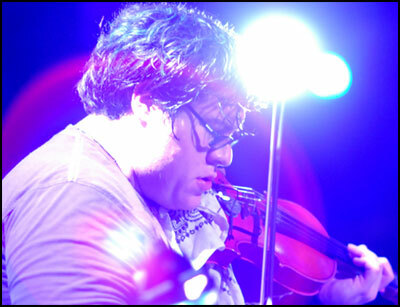 The lonely electric violin is joined by growing ranks of percussion, representing Zarek’s transition from isolated loner to political revolutionary. This is not the last we shall see of this new partnership, nor the last we’ll hear of the Zarek theme. The score to Disquiet is comprised of much more than just the Gaeta and Zarek themes. Many familiar themes are brought back, some of them in very unusual settings. 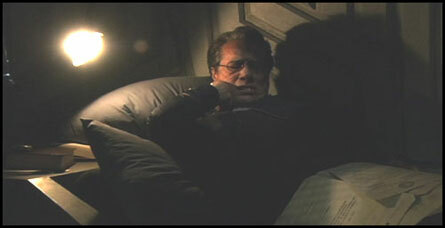 In the second half of the episode, he takes a darker turn. His sermon is now brimming with rage, as he questions the existence of God and tries to understand the tragic revelations of Earth. I collapsed the augmented major harmonies of his religious theme into dissonant, diminished and minor chords. The gamelan arpeggio of his theme is still present and unaltered, but it is now accompanied by darkness, frustration and ambiguity. As he riles the crowd into a frenzy, a fight breaks out between Tyrol and Hotdog. A battery of taikos kicks in, accompanying the energetic membrane flute solo played by Chris Bleth. The music is an obvious and intentional homage to my rousing boxing music, “Fight Night,” from Season 3’s Unfinished Business. 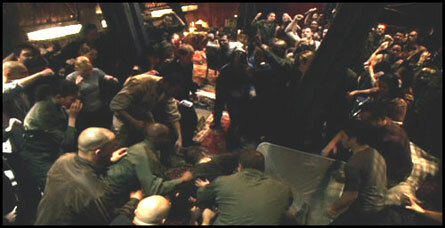 In the middle of the brawl, Head Six appears and attempts to comfort Baltar. The pounding taiko drums momentarily give way as I shift gears to address their conversation. I re-state Baltar’s religious theme in the gamelan, but now with the proper major harmonies restored, and a simple harmonium drone underneath. For this brief moment, the Baltar Religious theme sounds like it did throughout the first half of Season 4. Originally composed for Season 2’s Resurrection Ship, Parts 1 & 2, it has made numerous appearances since, always underscoring the deep, affectionate relationship between the President and the Admiral. 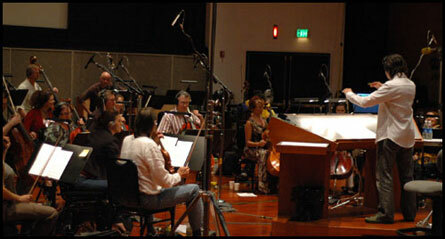 The last significant appearance of this theme was during the final scene of The Hub. 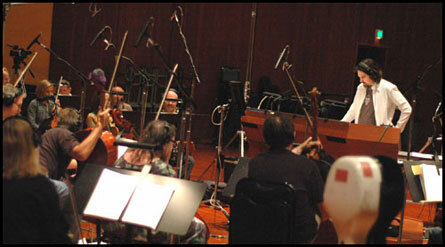 Their theme is traditionally played on the acoustic fiddle by Paul Cartwright. Listen during the scene where Roslin decides to throw away her medication and you’ll hear a simple, clear statement of it. 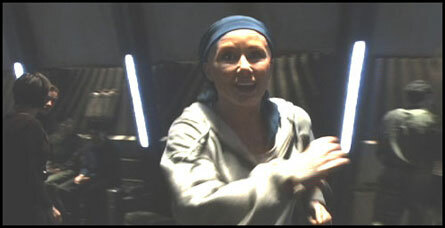 Later in the episode, the sequence where Roslin jogs through the ship provided me an opportunity to take their theme to unexplored territory. The arrangement I wrote for it is the most active, mysterious and complex version of “Roslin and Adama” yet. This particular cue happens to be subject of a new documentary Matthew Gilna and I are producing about the Galactica score. After the success of our mockumentary, “The Music of Battlestar Galactica”, we decided that we’d make a real documentary that genuinely covers how I score the show. I initially struggled to find the right emotional tone that would work on both stories as we cut back and forth between Adama’s quarters and Roslin jogging. As if this sequence weren’t complex enough already, I had to write a cue that would fit over two distinctly different versions of the sequence! In the director’s cut you’ll eventually see on DVD, the phone conversation plays for a totally different emotional beat, and there’s actually a scene that interrupts this jogging sequence. As a result, my score needed to be flexible, since I didn’t have time to score both versions separately. I had to write a single cue that would function in both versions. After the first phrase of their theme, the strings split into two contrapuntal lines. The violas and celli slowly drift away from the violins as the lower phrase cascades downward, to join the incoming bass line. After the second phrase finishes, the strings pick up the minor third ostinato from the gamelan and piano, and the frame drums enter. The music noticeably picks up steam as Roslin’s pace quickens. As we reveal that the mysterious jogger is, in fact, Laura Roslin, the cue modulates from C minor to A minor and a much fuller statement of their theme begins. 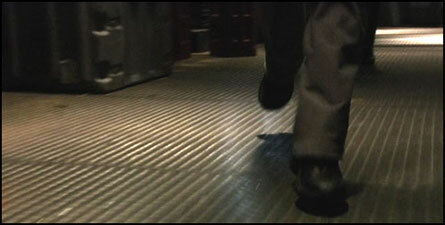 The scene reaches its climax as Roslin shifts from jogging to a full sprint. For this moment, I added to the ensemble the full arsenal of taikos and percussion, but somehow, the score was still failing to add enough excitement. An inspired idea came from my college mentor and dear friend Jim Hopkins, who was helping us out with the orchestral sessions for Disquiet and Notion. During all these transpositions, the contour of the “Roslin and Adama” melody remains the same, but it feels like we’re jumping around in exciting, new harmonic progressions. This may sound like a lot of technical musical jargon to some of you, but I’ll bet everyone could hear there was something special about this moment, something that made it different from every other version of “Roslin and Adama” we’ve heard in the past. The harmonic shifts, orchestration, melody and percussion all come together for the climax of this scene. 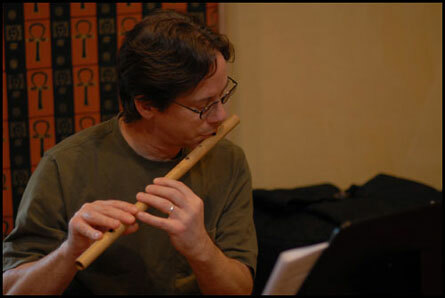 To shake things up a bit, the theme begins with Chris Bleth on the bansuri, an unusual instrumental choice for this theme that renders it a bit harder to recognize (how long did it take you guys to catch it?). However, halfway through, Paul Cartwright’s signature acoustic fiddle picks up the melody and takes us home, carrying us gently over the cut to black.